EMV card usage is increasing almost everywhere in the world as a billion new EMV cards enter circulation – but the US continues to lag behind, despite the fact that liability shifts to the retailer from 15 October this year. EMVCo figures show that by the end of last year, the number of EMV payment cards in circulation had increased by 1 billion, up 43% to 3.4 billion from 2.4 billion a year earlier. The highest adoption rate is in western Europe, where EMV chip card adoption is now 83.5%, up by 2% on a year earlier. But the lowest adoption rate of any region was the US, at just 7.3% adoption. No earlier figures were available for comparison. In the rest of the world, the fastest increases were in eastern Europe, which increased to 40.4% from just 17.4% a year earlier, and in Africa and the Middle East, where adoption rose to 50.5% from 38.9%. Canada, Latin America and the Caribbean followed at 59.5%, up 5% versus a year earlier, while Asia Pacific EMB card adoption increased to 25.4% form 17.4% a year earlier. The figures were based on statistics from EMVCo’s members – American Express, Discover, JCB, MasterCard, UnionPay and Visa. 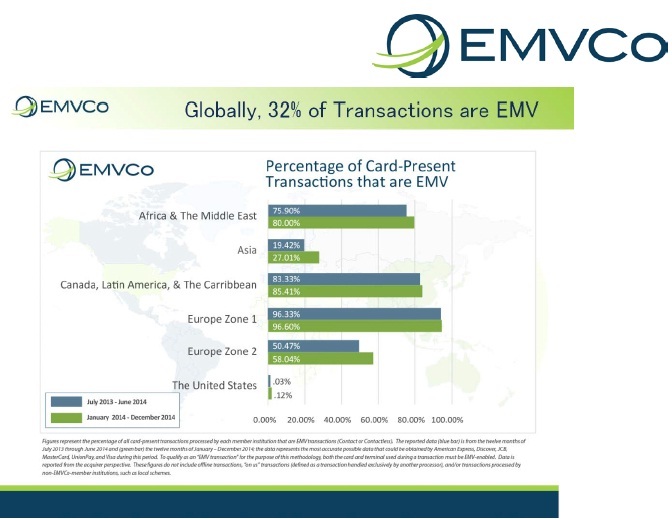 EMVCo also reports that 32% of all chip card-present transactions – both contact and contactless – conducted globally between January and December 2014 used EMV chip technology, up from 29% as reported in November 2014 by EMVCo. Western Europe maintained the highest percentage of EMV chip transactions, which accounted for nearly 97% of card-present payments. Over 85% of card-present transactions were EMV chip-enabled in Canada, Latin America and the Caribbean, while in Africa and the Middle East, the figure was 80%. EMV chip technology continued to gain ground in eastern Europe and Asia, where the percentage of EMV chip transactions accounted for 58% and 27% of card-present payments respectively. In the United States, which is currently in the process of migrating its payment infrastructure to EMV chip technology, 0.12% of transactions were EMV chip based. The US is finally adopting EMV after an eventful 12 months in which barriers have been overcome. Merchant reluctance is diminishing, good progress is being made, and the ‘EMV train’ is now picking up speed, according to a new report by analyst firm Celent. Criminals have deepened their focus on U.S. online transactions since the country’s October 2015 EMV liability shift, with card-not-present fraud expected to hit $6.4 billion in 2018, according to a new report from the U.S. Payments Forum. The expected total would represent a 23 percent increase from fraud losses in 2017, and a 68 percent increase from 2016. The growing use of chip cards – EMV for the cognoscenti – will spur criminals to try new directions in fraud, Al Pascual, practice leader at Javelin Strategy, told delegates at the Nacha Payments 2015 conference in New Orleans. But it will take a little time because criminals have established modus operandi and it takes them time to move from one practice to another. As the issuance of EMV cards continues to grow, consumers are using their chip cards to buy sporting goods and pay for parking, according to new data from CardFlight. US chip and PIN card roll-out – let’s shorten the time to process; where do I sign! From a technology perspective, the family home has decided to rush headlong into the 21st century. When our home was built we thought we were being extremely progressive in having a Panasonic "4 lines, 10 extensions, PBX" installed with separate lines for my wife and myself and then a line for business and yes, one dedicated line for the fax machine. Cool… but fast forward a decade and a half and with the home up for sale, we were politely advised to take out all those handsets and close the door on the PBX. As the US moves to adopt EMV chip and PIN cards and mobile payments, authentication is becoming a serious concern, particularly for customer not present transactions – evidenced by the number of Money20/20 exhibitors focusing on the topic in contrast to the blockchain focus of much of last year’s event.